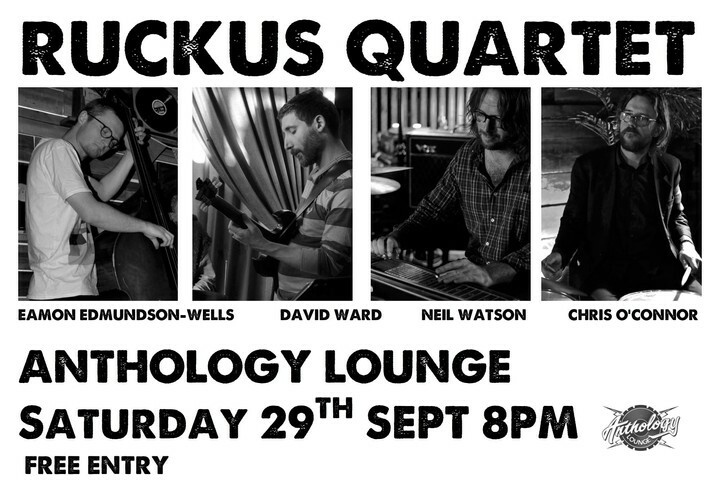 Ruckus are an improvising group playing tunes by guitarist David Ward, as well as selected delicacies from the jazz tradition. Long marinated in such juices as Monk, Coleman, Mingus, Lacy, Zappa and Frisell, Ruckus' music is melodic, humourous, rhythmic and joyous. From twisted tango and carnivalesque romps to disheveled swing and free tunes, this group agrees with Frank: jazz ain't dead, it just smells funny. As well as Ruckus stalwarts such as Chris O'Connor (Phoenix Foundation) and Eamon Edmundson-Wells, (Everything) Ruckus are excited to be joined on Pedal Steel and Guitar by the fabulous Neil Watson (Tami Neilson). They will also be debuting a suite of of new compositions by David Ward.